3 Bedroom End of Terrace House For Sale in Leicester for Offers Over £180,000. 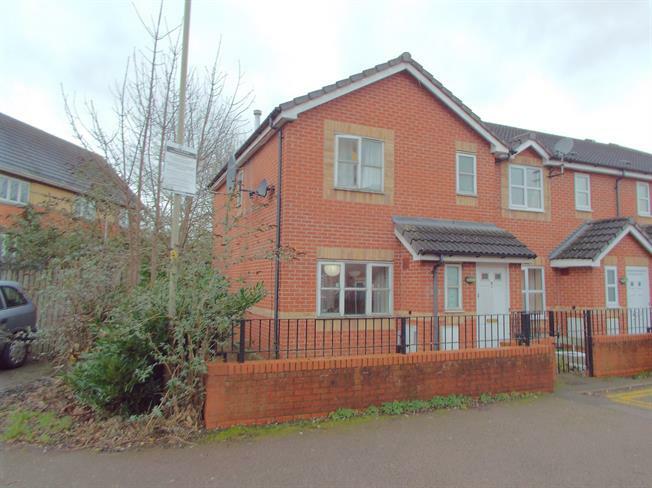 This three bedroom end of town house could be bought to either live in or if preferred be bought to let out. The accommodation in brief to the ground floor comprises of an entrance area, WC, lounge and a kitchen/diner. To the first floor are three bedrooms, a bathroom, en-suite to the main bedroom and with all of these bedrooms benefitting from built-in cupboards. Externally to the rear is some outside space and with access to one allocated permit car parking. Finally this property is being offered with no chain. Wooden front door. Radiator, carpeted flooring. Double glazed wood window. Radiator, vinyl flooring. Low level WC, wash hand basin. Double glazed wood window facing the front. Radiator, carpeted flooring. UPVC back double glazed door. Double glazed wood window facing the rear. Radiator, vinyl flooring. Work surface, wall and base units, single sink, integrated electric oven, integrated gas hob, overhead extractor, space for washing machine. Carpeted flooring. Access to three bedrooms and a bathroom. Double glazed wood window with obscure glass. Radiator, vinyl flooring. Low level WC, single enclosure shower, wash hand basin. Double glazed wood window facing the rear. Radiator, carpeted flooring. Double glazed wood window with obscure glass. Radiator, vinyl flooring. Low level WC, panelled bath, wash hand basin.